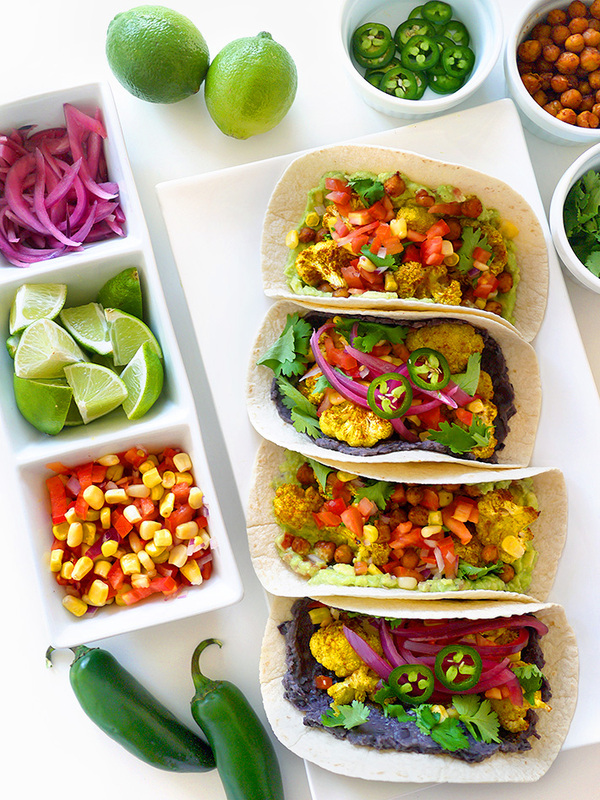 Anyway, if you want to get into the spirit with me and celebrate Taco Tuesday, here are my 2 recipes for easy vegan cauliflower tacos. They’re delicious, quick to whip up, and made with only good things. 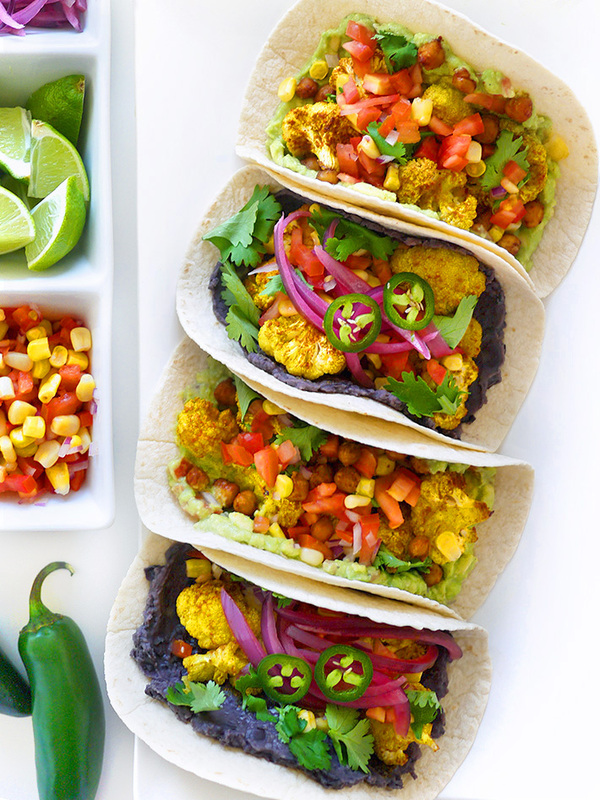 Whether you’re an omnivore, eating dairy-free, or are a strict vegan – you’ll love these rainbow taco beauties. If you don’t have every one of these, that’s okay, the recipe will still turn out. I’d say cumin and paprika are the most essential, but if you already have a fully stocked spice rack, then the more the merrier! 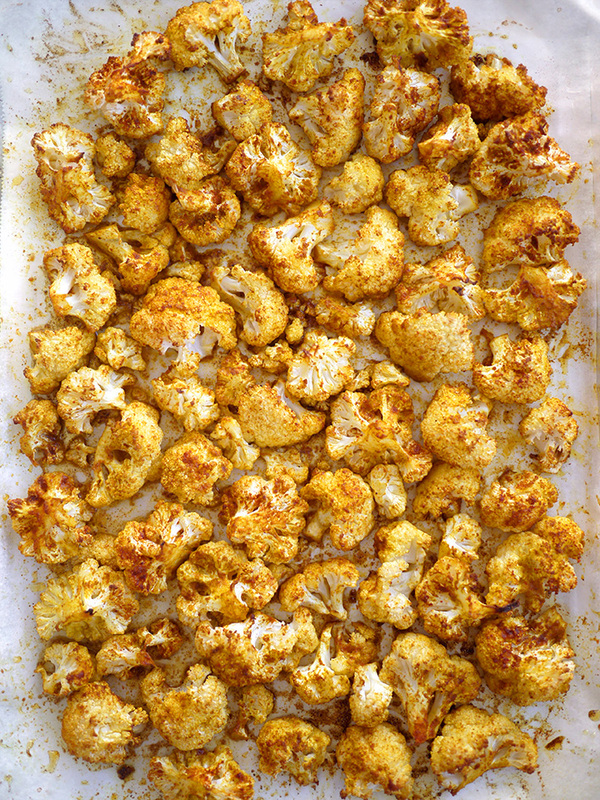 Cut your head of cauliflower into small florets, drizzle them with olive oil, and sprinkle them with salt, turmeric powder, medium curry powder, and paprika. Massage that all together until everything is well coated, and roast on a parchment paper-lined baking sheet at 400 degrees F for about 30 minutes. 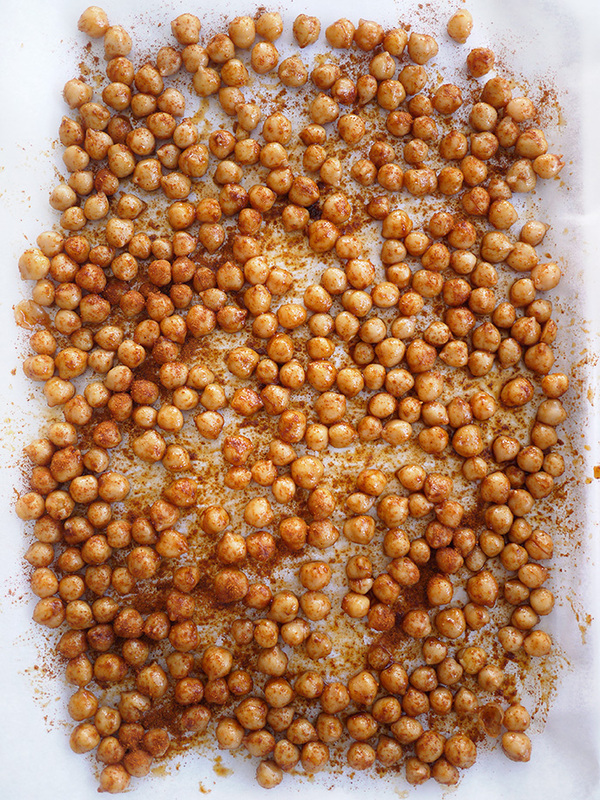 Drain and rinse your canned chickpeas, then dry them thoroughly (so the oil will stick!). Roll them around in olive oil, salt, paprika, cayenne pepper, chili powder, cumin, and garlic powder. I like to make my crispy chickpeas spicy, so I’m generous with this. Roast them in a single layer on a baking sheet at 430 degrees F for 20-30 minutes. If you’re in a pinch for time, you can instead broil them on the top oven rack for 10 minutes until crispy. 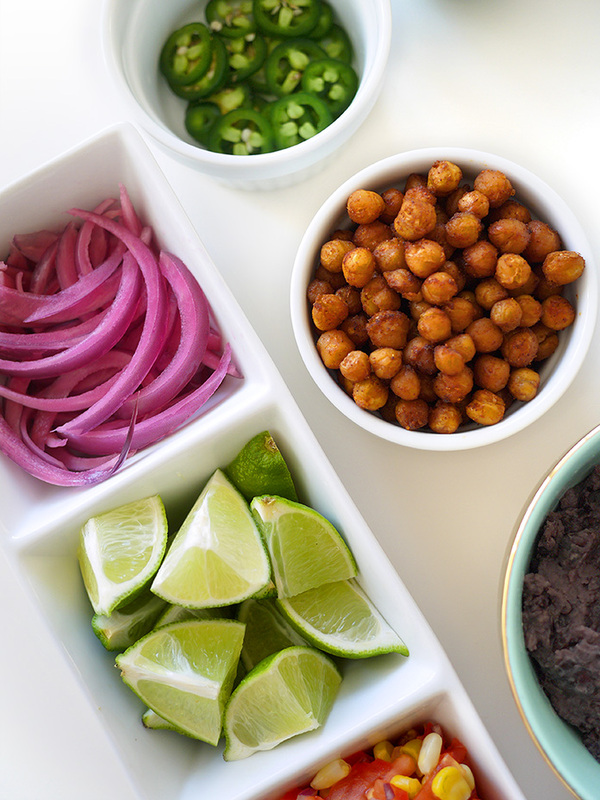 While all that’s happening, get your taco-making station ready. Chop and lay out all your ingredients. Dice one ripe avocado and mash with a fork until smooth. Squeeze the juice of 1 lime, add a pinch of salt, a pinch of cumin, and some finely diced tomato and red onion. 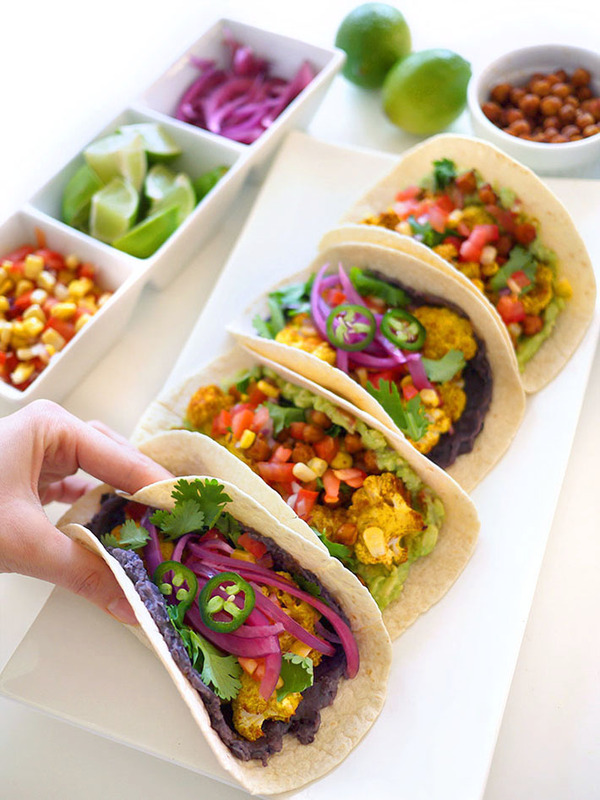 Combine 1 finely diced tomato with 1 cup corn, 1/3 cup finely diced red onion, and some finely minced fresh jalapeño. Add the juice of half a lime, a teaspoon of olive oil, and a pinch of salt. If you want to make the pickled red onion, prep this about 3 days before you want to eat. Thinly slice a whole red onion into long strips, and pack that into a large jar with a few pieces of chopped fresh beet (for extra pink colour). Once the jar is tightly packed, fill the rest up with hot water with about a tablespoon of salt dissolved into it. Close the lid tightly, shake, and leave that to do its thing. Strain most of the liquid out of a can of black beans, then heat that up and blend or mash it (I used a fork). Add 1-2 tablespoons of olive oil, a pinch of salt, paprika, and cumin. Chop up your cilantro, cut up your lemon wedges, and slice some jalapeño. Now you’re ready to assemble! 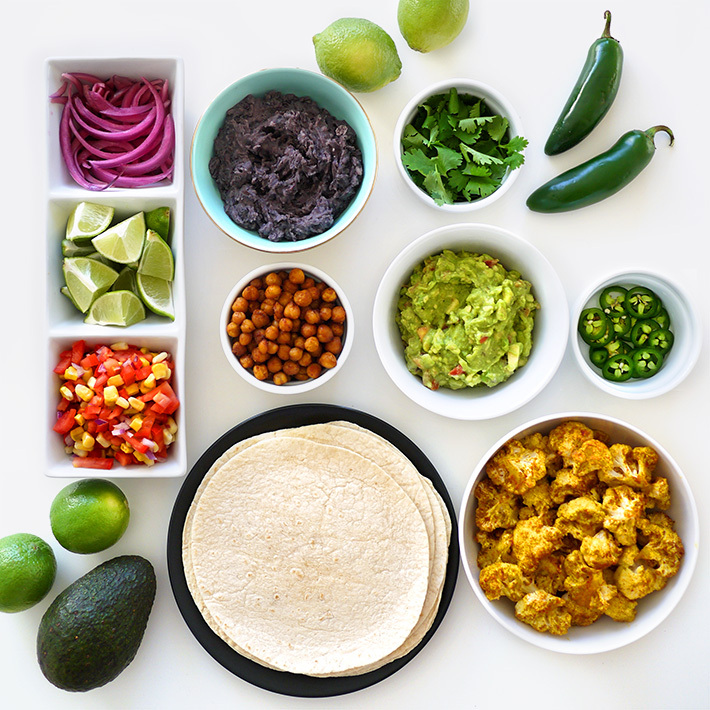 Flour tortilla, black bean spread, roasted cauliflower, pico de gallo, cilantro, pickled red onion, jalapeño slices. 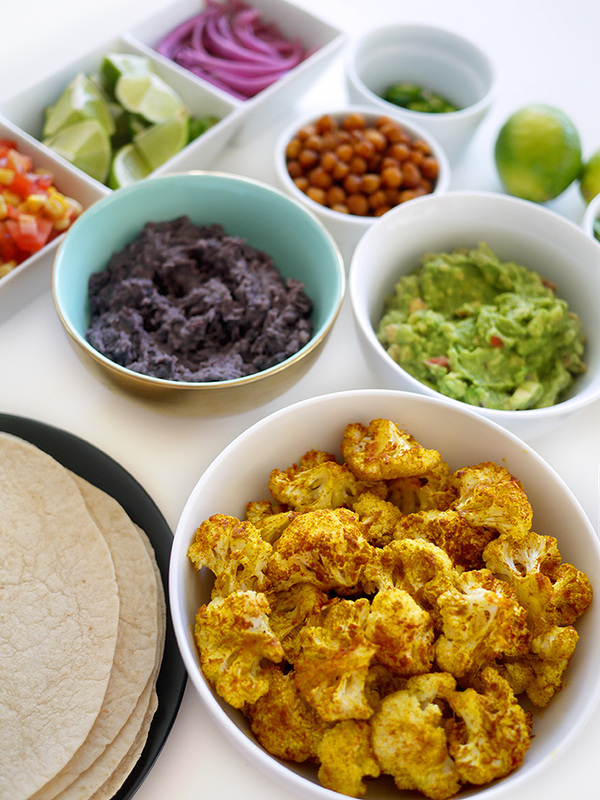 Flour tortilla, guacamole, roasted cauliflower, spicy chickpeas, cilantro, pico de gallo. Both versions are protein-packed with a melange of balanced flavours. I can’t decide which I like better! Bone app the teeth, and thanks for reading! Let me know in the comments if you plan to make this, and if you want more recipe posts.